This past spring I spent three weeks in Seoul, South Korea visiting my son, Christian. I knew that I would have a lot of free time on my hands, as he was unable to take time off of work during the week. The question was, apart from touring, what was I going to? I remembered that NAPO has a sister organization in Seoul – The Korea Association for Professional Organizers (KAPO). Thanks to Eileen Bergman and Barry Izsak, I was able to get in touch with Ms. Connie Jeung, the founder of KAPO, to set up a visit during my stay. I was pleasantly surprised (and relieved) when Connie arranged for Professional Organizer, Sobin Yim, to pick me up at my hotel. My Korean language skills are non-existent and Seoul is a very large city that can be tricky for me to navigate. As we headed to KAPO I learned that Sobin lived in the U.S. to study at the University of Illinois in Chicago where she obtained her Bachelor’s and Master’s Degrees in Chemistry. Sobin is a member of KAPO and is currently working towards becoming a professional organizer. Thanks to her English-speaking skills, she was able to accompany me during my visit to KAPO and interpret for me. When we arrived at KAPO I was taken to Connie’s office to meet her. The best word to describe Connie is dynamic. She is the founder of KAPO and the owner of Korea’s first organizing business, DUMIN. Before she became an organizer, she worked as a Logistics Expert. In the early 2000s, while on a visit to Canada, Connie discovered the world of organizing and learned that she could turn this skill into a career. When she returned to Korea, she continued to research organizing and discovered NAPO. In 2011 she established KAPO and she launched her professional organizing company, DUMIN, in 2012. In April 2017 she became a member of NAPO. Since she began her business, Connie has worked not only with individuals, but also with government agencies and corporations to improve their productivity in addition to their organization skills. I found two of her projects particularly interesting. 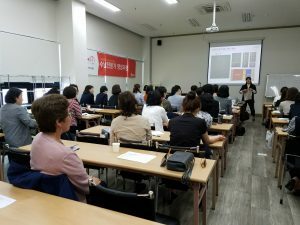 The first project was standardizing the layout and storage of medical equipment used by EMTs in their ambulances, as well as preparing a standardized instructional manual now used by EMTs throughout Seoul. The second project is working with a government agency to help small business owners who own stalls in the city’s open-air markets. 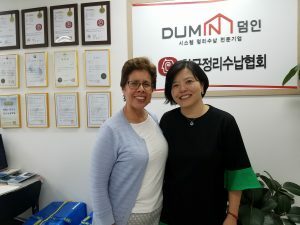 Because of the ever-increasing competition from department stores, DUMIN has been helping storeowners with arranging their goods, displays and developing paper management systems. After several visits to a couple of open-air markets, I can attest that this is quite an undertaking because these large markets are a hub of activity from morning until night. Learning about KAPO was an eye-opening experience. South Korea is 38,691 square miles – roughly 20% of the state of California – with a population of over 51 million. If you look at a map, South Korea would fit in the area between Los Angeles and San Francisco. As of December 2017, KAPO has approximately 72,000 members compared to NAPO’s approximately 3,500 members. To say I was surprised is an understatement. However, once I learned how it works I began to understand. Level 2 Professional Organizers – The majority of organizers are at this level. These members have families and work from home. Their training lasts 15 hours and covers personal household management and organization, which they will use to maintain their homes. Level 1 Professional Organizers – These organizers have completed Level 2 training and have decided to pursue a career in professional organizing. Their training is 90 hours. They may start their own business or work for an organizing company once they obtain their license. Lecturers – These organizers have completed Level 1 and 2 training. 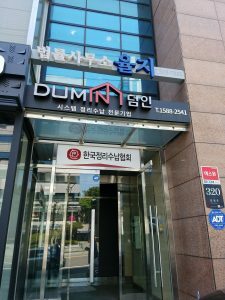 Once they have completed instructional training, they are able to train other students either in Seoul or other parts of South Korea. Unlike NAPO, there are no webinars or online training. Because of South Korea’s size, Connie believes that in-person classes are more effective. I was able to visit two classes to get a first-hand look at the kind of training members go through. 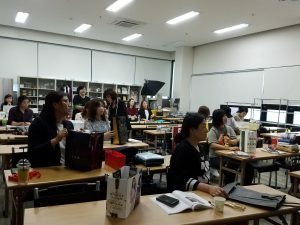 In the first class, the Level 2 students were converting shopping bags into containers. The idea is to repurpose paper bags the client already has so they don’t need to buy containers. If you like paper folding, this is the class for you! One component of Level 1 training is to learn how to give presentations. In the second class I observed, the students were being evaluated on giving a presentation. The student had 10 minutes to speak on an organizing topic. At the end of the presentation, Connie evaluated her while the rest of the students completed a written evaluation. During our meeting I realized that some of the services that are so common in the U.S. are less popular in South Korea. When I mentioned paper organizing, I got quizzical looks. I explained in very general terms the issues that we often come across with paper management such as taxes and other financial documents. Connie explained that in Korea there are very little financial paper management issues because everything is done online. No checks, no bills, no tax returns – nothing! I don’t know how their tax system works, but it appears that it is far simpler than ours. I was flabbergasted! Photo organizing is not offered, nor does Minimalism appear to be a trend. Prior to the economic surge of the 1906s, Korea was primarily an agrarian society. It was annexed by the Japanese from 1910-1945 and then was invaded by the North Koreans in 1950. Family photographs and mementos were destroyed during the conflicts. As a result, many South Koreans cherish whatever items survived the turmoil. Though our services may differ, it is clear that South Koreans – like Americans – still need to get organized. South Korea is now the world’s 11th largest economy and is projected to grow at least 50 percent annually in the coming years. A strong economy means plenty of opportunities for shopping! Shopping in Seoul is on a whole new level. There are shops everywhere: open-air markets, department stores, boutiques, as well as online shopping. 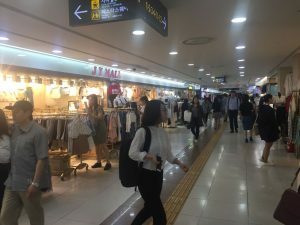 Even the extensive subway system is cluttered with shops. However, shopping is not the only contributor to clutter. South Korea’s economic transformation has also impacted family life. While there are houses to be found in Seoul, residents primarily live in apartments, many of them high-rises. Naturally, this means less storage space. The family dynamics of South Koreans are also changing, which impacts organization. More women are joining the workforce and continue to work even after they are married. Additionally, families are choosing to have only one child. This is often in order to ensure that children have a quality education, which often means sending their children to two schools: a traditional school in the morning followed by another school in the afternoon. Eventually many of these students will attend a university overseas. Busier parents who are focused on their child’s education means less time to organize. And, it doesn’t end there. As in the U.S. the Sandwich Generation is alive and well in South Korea. With a growing senior population, adult children are also responsible for the care of their aging parents. Time to take care of family responsibilities is a premium. Recently, legislation was passed to reduce the workweek from 68 hours to 52! As organizers, we know all too well that these changes are a recipe for a harried population and accumulating clutter. 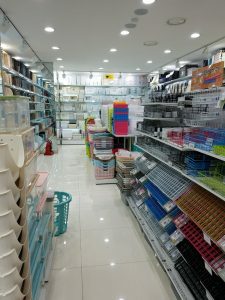 Fortunately, KAPO is prepared to help South Koreans de-clutter and get organized! Connie and KAPO are ensuring that the message about getting organized in South Korea is spreading. We may not speak the same language, but our goals are the same: reduce clutter, restore order, reclaim our lives! A special “Thank You” to Connie Jeung and Sobin Yin for all their attention during my visit to KAPO. My visit to South Korea and KAPO was made even more special thanks to your hospitality!